WARNING: The Internet Explorer browser (IE) is no longer supported by BbLearn. If you experience problems uploading files via IE, please switch to a supported browser (Chrome, Firefox, Safari). Go to the Assignment Submission location. Click on the Title of the assignment to submit your work (e.g., Assignment 1). Students are responsible for verifying success in submitted their assignment by confirming they have received a submission receipt via email. The Upload Assignment page will display. 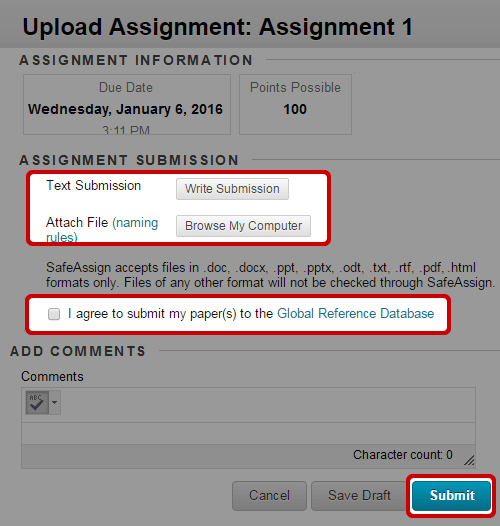 Review the instructions for the assignment listed under Assignment Information. Click the Write Submission button to type your submission directly into the BbLearn Text Editor. Be sure to type your answer offline and then paste it into the box using Control + V (or Mac - Command + V). 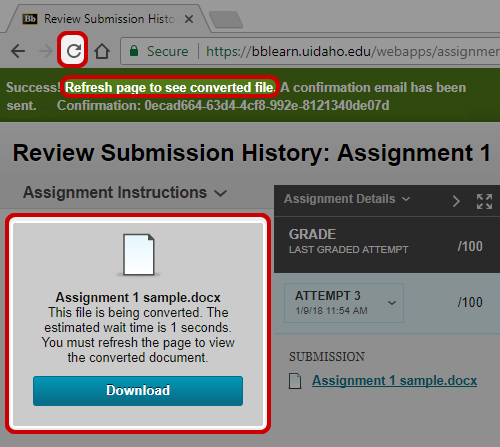 Drag and drop your assignment submission file into the area encircled with a bold dotted line or click the Browse My Computer button to upload your submission. See file naming help to ensure your assignment is viewable. ZIP any files that have an extension of .exe or similar before uploading them. When submitting a file, be aware that very large files take a long time to upload to BbLearn (many minutes). Before pressing the Submit button, make sure your file name shows directly below the dotted line area indicating that it has uploaded successfully. 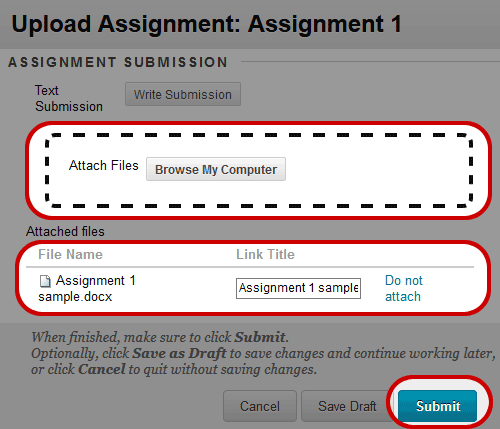 Click on the Submit button once it is available to send the assignment to your instructor. Always save a copy of your assignment for your records! For a group assignment, a group should appoint one team member to submit a collaborative submission on behalf of the group. If you are attempting to submit a group assignment and you see a Review Submission History page containing a "Continue" button, then click on the "Continue" button to proceed to the submission area. 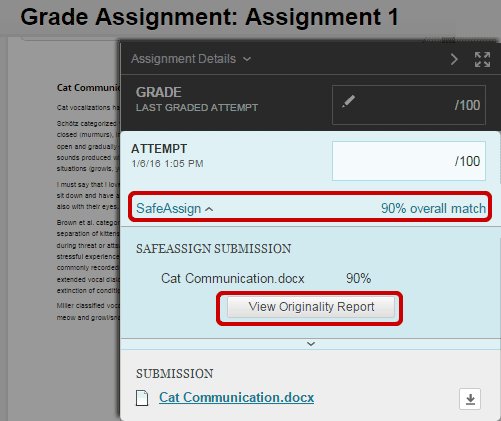 If you do not see a "Continue" button, it is possible that someone else in your group already submitted the group assignment document. BbLearn displays a Success Message confirming your assignment has been successfully submitted. BbLearn sends you a submission receipt via email. Submission receipts can be viewed through My Grades under the Submitted tab. Once there, scroll to the bottom of the page and click on the number of submission receipts generated for you. The next screen will show detailed information regarding each submission receipt. Note: Your Instructor has access to these receipts through their Grade Center. SIERRA OS: Safari > Preferences > Privacy > Cookies and Website Data > set to "Always Allow"
Download or print your assignment submission by returning to the assignment submission link or by clicking on the assignment's Title in the My Grades area. 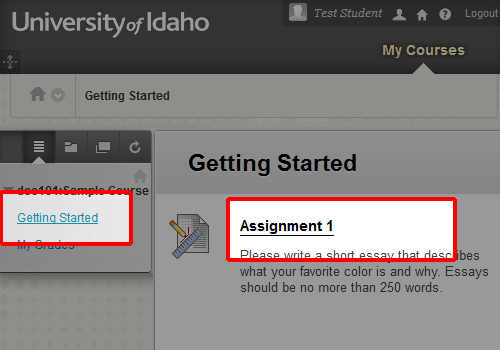 Either option will bring you to the assignment submission view (shown below). Two locations on the page display icons which, when clicked, will download your original submission file (the annotations are not included). Print your original submission file by clicking on the print icon (the annotations are not included). - For a SafeAssign assignment, you will see the following language. This language indicates that by submitting your work, you agree to allow it to be used and stored as part of the SafeAssign services. If you have questions regarding this, please contact your Instructor for further clarification. - You may check the box provided to voluntarily agree to submit your work to the Global Reference Database which is a separate database used to help prevent plagiarism. You are NOT REQUIRED to check this box to submit your work. - If your instructor permits you to view the originality report, you should see an originality score for your work. If instead you see "Report in progress...", this just means the SafeAssign originality report has not yet been processed and you should check back later. You may need to exit and return to refresh the browser. NOTE: The originality score is ONLY a warning indicator and is not a measure of your intentions or dishonesty. Originality scores below 15% show NO EVIDENCE of plagiarism. Review work with scores above 15% to see if the matches are properly attributed. - Click SafeAssign to expand this section. - Click View Originality Report. - If some of your work has been marked with a color, this indicates a match to other sources was found. The originality report displays the list of potential sources and each source is highlighted in a different color. 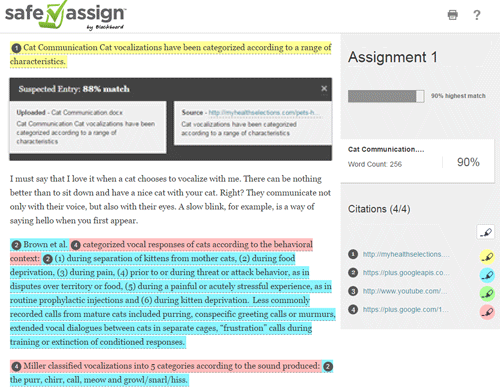 - Click a highlighted phrase in the text of the work to view a comparison of it to the original source. - Click on the printer icon at the top of the page to print the originality report. - Close the originality report when you are done viewing it.